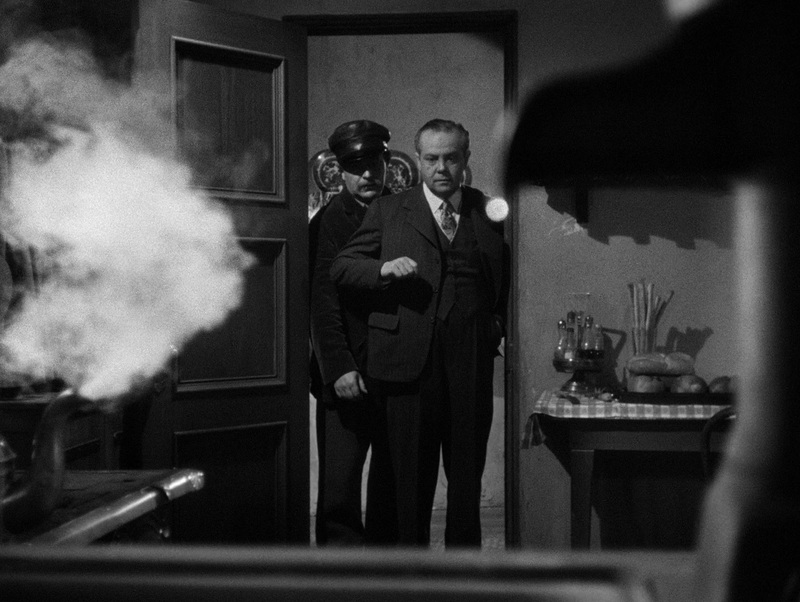 Legendary Parisian detective Henri Cassin (Steven Geray) has at long last met his match: overwork. His superiors mandate a holiday – Cassin's first in over a decade – and he relishes the opportunity to recharge in the French countryside. Cassin has barely stepped foot in this tiny village before finding himself smitten by Nanette (Micheline Cheirel), the young daughter of the innkeepers hosting him, and the feeling is very much mutual. She stands in awe of this famed detective, seeing him as an escape from the provincial life to which she fears herself tethered. The middle-aged Cassin, long unable to seek romance due to the crushing obligations of his career, is as taken by Nanette's beauty and youth as he is by the relaxed, pastoral splendor surrounding her. Despite having known her but a short time, Cassin is almost immediately prepared to ask Nanette for her hand in marriage, a request she (and her mother) would be all too willing to grant. 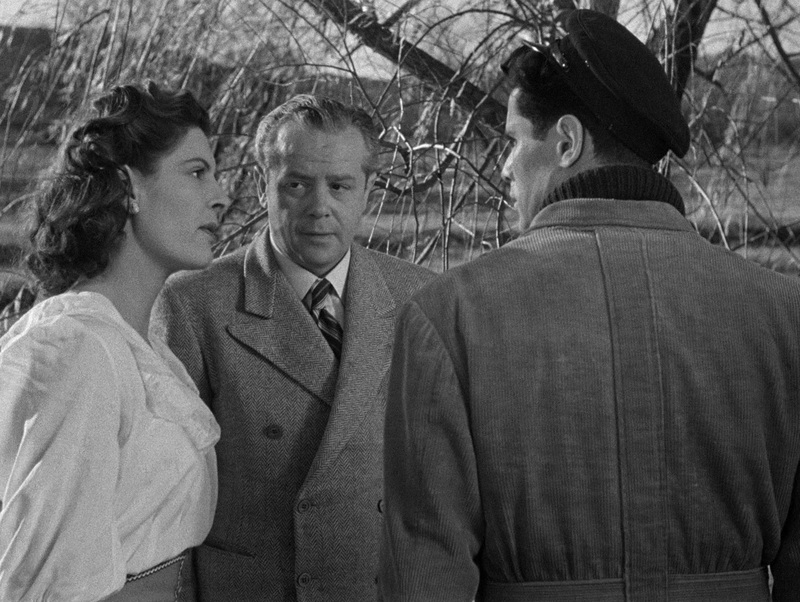 Less enthusiastic about this blossoming romance is Léon (Paul Marion), Nanette's childhood friend and...well, fiancé. Nanette can't help but look at the industrious but hardly well-off Léon as an anchor, given his devotion to his farm and the certainty that she'll never taste Parisian cuisine or indulge in high fashion as his wife. Léon snarls that he'd rather see Nanette dead than hanging off the arm of another man. After she goes missing and Léon too is nowhere to be found, Cassin can't help but suspect the worst. He came to St. Margot as a break from his hectic career as a detective, and instead he's finding himself investigating the loss of his one great love. The central challenge in reviewing So Dark the Night is resisting the urge to reveal the course the investigation takes from there. It's a twist that, while cleverly and subtlely foreshadowed, demands to go unspoiled. All the more tragic is that this revelation is one of the few particularly interesting facets of the film. 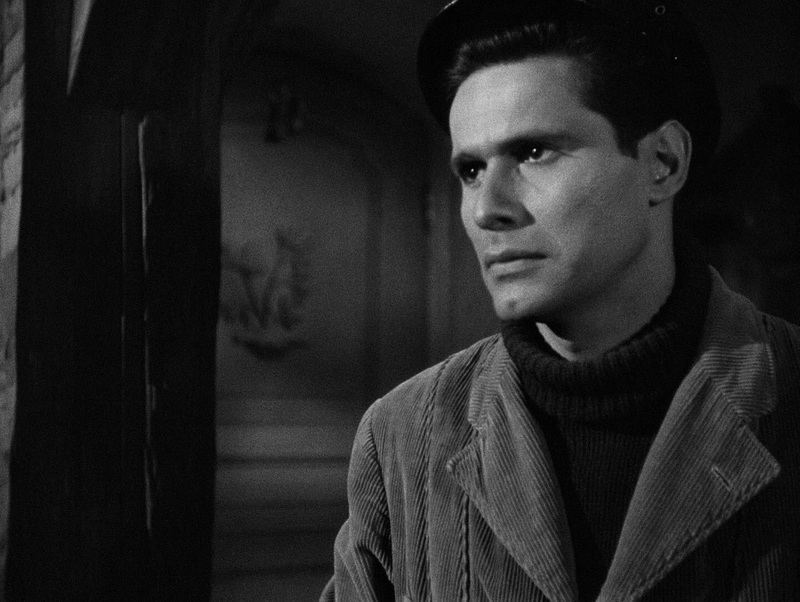 Though four separate critics marvel at So Dark the Night throughout the special edition that Arrow Academy has assembled, I can't count myself among them. I respect its unconventional storytelling. I appreciate what director Joseph H. Lewis (Gun Crazy) was able to achieve with such scant resources, reproducing something passably resembling the French countryside on the Columbia backlot and offering character actor Steven Geray a rare leading role. Still, effectively nothing about So Dark the Night works for me. Perhaps it would've better resonated that Cassin is a brilliant detective if he'd been introduced solving a case or at any point early on seeming particularly keen and observant. The movie's half over before he detects much of anything, coasting until then to what limited extent it can on Geray's bland amiability. There's something to be said about the asymmetry of opening the film without a care in the world yet ending so bleakly and emotionally shattered, but really, it just makes the prolonged first act seem frivolous and empty. ...to Brother Theodore as a hunchback inexplicably transplanted from the 15th century. Not recommended. Black levels are as robust as one would hope for a film so often described as a noir, and never once are these blacks crushed. The remastering is immaculate, devoid of any nicks, scratches, distracting flecks of dust, or other anomalies. As ever, Arrow's skillful AVC encode faithfully preserves the fidelity of the restoration. I just wish I were as enthusiastic about So Dark the Night as a film as I am about its presentation here. So Dark the Night arrives on a dual-layer Blu-ray disc at an aspect ratio of 1.33:1 – not quite the 1.37:1 listed on the packaging, but it's doubtful anyone watching casually would notice. Presented in uncompressed, 24-bit mono, So Dark the Night's soundtrack leaves similarly little room for complaint. The film's dialogue – predominantly in English, despite the provincial French setting – is reproduced with sterling clarity, not marred by any intrusive hiss or the slightest flicker of distortion. Some faint background noise is audible but too mild to warrant any concern. Given the film's age, obscurity, and exceedingly modest budget, I'm thrilled with what Sony and Arrow have delivered. So Dark the Night additionally offers optional English (SDH) subtitles as well as an audio commentary. Audio Commentary: Film critics Glenn Kenny and Farran Smith Nehme contribute a well-researched commentary track, delving into the lives and careers of most everyone on both sides of the camera, the psychological underpinnings of So Dark the Night, other thrillers with a similar bent to their murderers, extensive analysis of its visual style and skillful masking of limited production values, and discussion of its critical reception, both upon release and in the decades that followed. If I have one complaint, it's that there's a bit too much recapping of the action unfolding on-screen. That aside, this is a worthy listen, even for someone like myself who can't claim to much care for So Dark the Night. A Dark Place: Joseph H. Lewis at Columbia (20 min. ; HD): Imogen Sara Smith (In Lonely Places: Film Noir Beyond the City) opens by discussing Joseph H. Lewis' gradual ascent as a filmmaker, tackling most every conceivable genre on Poverty Row before settling into Columbia Pictures. Though the title of this appreciation would perhaps suggest a greater examination of Lewis' work at Columbia, the emphasis of "A Dark Place" is directed primarily towards So Dark the Night. 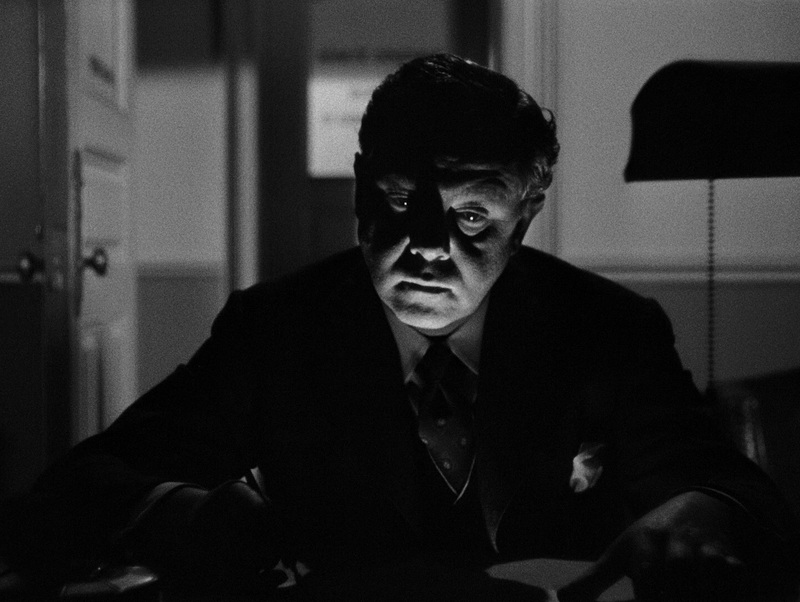 Among Smith's notes are the role of psychology in noir, with the mind itself serving as a mystery, the long-established rules of the procedural that it shatters, the contrast drawn between the dark urban settings so typical of noir with this film's sleepy French village, and what a showcase for Lewis' visual flair So Dark the Night proves to be. Theatrical Trailer (2 min. ; HD): A high-def trailer rounds out the extras. While I appreciate what the newly-commissioned artwork by Tonci Zonjic is attempting to convey, it's not all that compelling, nor has the original art on the reverse aged well. The accompanying booklet features David Cairns' terrific essay "An Inspector Falls", which features comments by Joseph H. Lewis sourced from the only lengthy interview ever conducted with the director as well as a thoughtful analysis of So Dark the Night's cinematography. Perhaps of the greatest interest is the parallel drawn screenwriter Martin Berkeley's later naming of some 150-plus celebrities to the House Un-American Activities Committee and the themes that drive So Dark the Night. 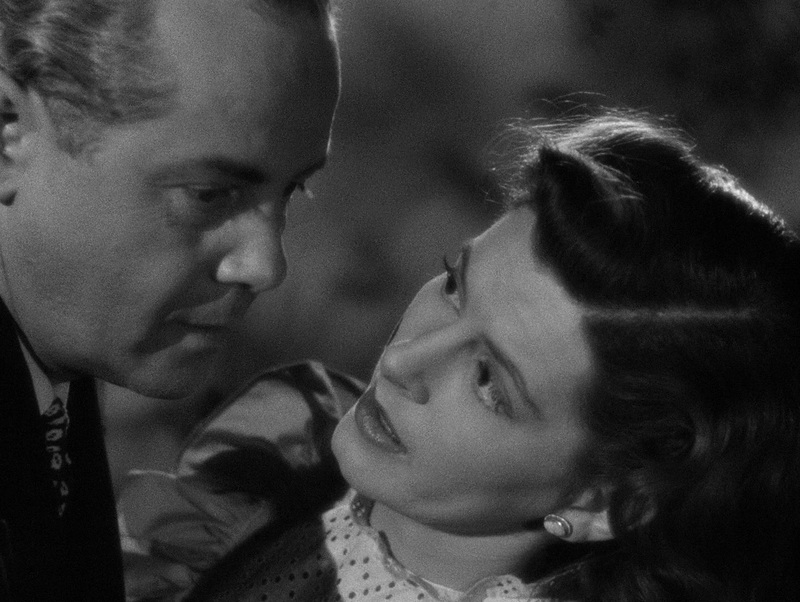 Arrow Academy is releasing So Dark the Night alongside Joseph H. Lewis' better-regarded My Name Is Julia Ross, and given their extremely short runtimes and limited extras, it's a mild disappointment that they haven't been collected into a double feature. Longtime admirers of the film will surely appreciate the striking presentation and some ninety minutes of extras, but a mystery this tepid and uninvolving is difficult to recommend as a purchase sight-unseen, especially at this price point. I'd suggest waiting for one of Arrow's sales or passing altogether. Stream It / Rent It.